Description: A two-day workshop bringing together climate and geo-scientists from around Sydney and international collaborators on the DCO-funded Deep Carbon Modelling project. 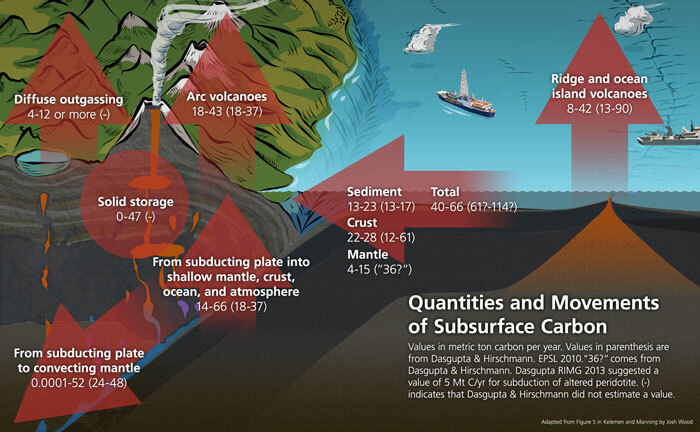 Deep carbon science describes the multi-disciplinary effort to unravel the dynamic interactions of carbon-bearing systems in deep time. The workshop will focus on exploring the interplays between the atmosphere, oceans, crust and mantle in the deep carbon cycle, and on the modelling tools used for conceptualising and visualising this data in new and innovative ways. Schematic diagram of the deep carbon cycle, adapted from Kelemen and Manning (2015).